Apple is planning a significant investment in LG Innotek to secure supply of 3D sensing modules for next-generation iPhone and iPad models expected to launch this year, according to Korean website The Investor. The upfront payment could be worth as much as around $820.9 million, which LG Innotek would use to build additional facilities for production of 3D sensing and camera modules for mobile devices, the report claims. The 3D sensing modules assembled by LG Innotek, including the flood illuminator and dot projector, are key components of the iPhone X's new TrueDepth camera system, enabling features such as Face ID and Animoji. The investment would make sense given Apple plans to launch a refreshed iPhone X, a larger iPhone X Plus, and a mid-range iPhone each with Face ID later this year, according to KGI Securities analyst Ming-Chi Kuo. Apple will also release at least one iPad Pro model with Face ID this year, according to Mark Gurman at Bloomberg News. The investment could help Apple avoid the temporary supply chain issues it experienced with 3D sensing modules late last year, ensuring availability of the new iPhone X, iPhone X Plus, and iPad Pro is more plentiful. I'm looking forward to an iPad Pro with slim bezels and Face ID! All-screen 10.5" iPad Pro with Face ID? FaceID would make sense on the iPad in conjunction with TouchID, and ONLY provided the numerous kinks (e.g. operating on landscape mode) are fully ironed out first. From someone with a Face ID device, I don’t think I would want both on my device. Face ID is plenty. Just make Face ID better and for iPad. Plenty. Why would the next version not be called XI? Because Americans don’t understand how Roman numerals work. LG and Samsung = Android. So while we all talk about how innovative Apple is, remember they rely on the rest of the industry to produce components. I'm not saying it's bad, but the after being in the tech industry for 30 years, the industry is incestuous and makes strange bedfellows. Apple is planning a significant investment in LG Innotek to secure supply of 3D sensing modules for next-generation iPhone and iPad models expected to launch this year, according to Korean website The Investor ('http://www.theinvestor.co.kr/view.php?ud=20180109000879'). The upfront payment could be worth as much as around $820.9 million, which LG Innotek would use to build additional facilities for production of 3D sensing and camera modules for smartphones, the report claims. The investment would make sense given Apple plans to launch a refreshed iPhone X, a larger iPhone X Plus, and a mid-range iPhone ('https://www.macrumors.com/2017/11/13/kuo-three-new-iphones-2018/') each with Face ID later this year, according to KGI Securities analyst Ming-Chi Kuo. Apple will also release at least one iPad Pro model with Face ID ('https://www.macrumors.com/2017/11/08/apple-2018-ipad-face-id/') this year, according to Mark Gurman at Bloomberg News. The investment could help Apple avoid the temporary supply chain issues it experienced with 3D sensing modules late last year, ensuring availability of the iPhone X, iPhone X Plus, and new iPad Pro is more plentiful. 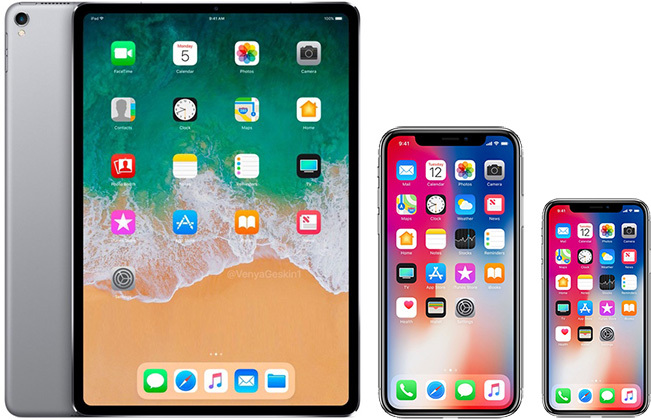 No need, iPad bezels are big enough to encompass FaceID without the need for a notch. Uh, how do you think we number the Super Bowl? We understand Roman numerals just fine. Perhaps your ignorance is in need of an update.